How to Bind Data to a ListView Control in WPF ? 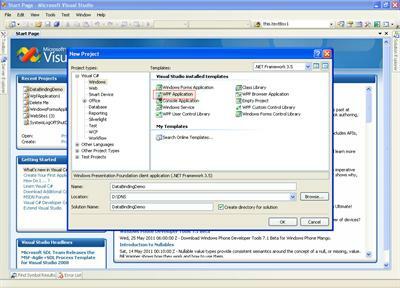 DataGridView Control is not available in WPF application. Most of the time the requirement is to show data in tabulated form. In this article, I will explain how to use ListView Control in WPF to tabulate data by binding a DataTable. This articles also explain WPF and Database onnectivity using ADO.Net classes. When I started working on Windows Presentation Foundation (WPF) with ADO.Net, I realized the very much important control used in Windows Application to present data in tabulated form the DataGridView control is not present in the control list. In most of the management related applications there is always need to display data is tables. I was searching for a solution in WPF and finally I learned how we can use ListView control to tabulate data. We are going to learn WPF Data Binding using ADO.Net with an example. 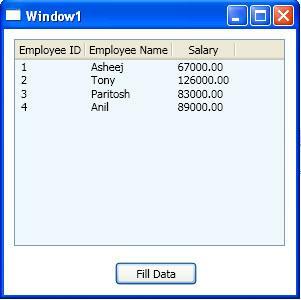 Create a table Employee in the SQL Server database and add few records to it as follows. You can see the Window1.xaml file on your screen. Next we have to add a ListView control and a button inside the <Grid> and </Grid> tags. On the button's click we will load the data from the database table into the ListView. Place the following code between the <Grid> and </Grid> tags of the Window1.xaml file for adding ListView and a Button control. And now the Window1.xaml file will have the following user interface. What is important in the above code? The above code simply adds a ListView control (listView1) and a button (btnFillData). The following lines are important in the code. The code changes the View style of listView1 to Grid and adds three columns with headings Employee ID, Employee Name and Salary which are binded to the Employee table's columns EID, ENAME and SALARY respectively. Now remains the ADO.Net code for binding an SQL Server database. In the Window1.xaml.cs file we need to use the following namespaces. Create objects of necessary classes and initialize them as follows. Go back to Window1.xaml file and double click on the button. Place the following code on button's click event. Now we are done with Everything. Execute the application and check the output. You will find a good looking listView1 control. Click on the Fill Data Button and the table is displayed in the ListView. 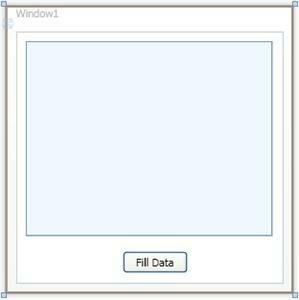 Hence in WPF we can use the ListView control to fill the gap created by the non availability of DataGridView. You can also find the demo application in the attachment. Download it for your reference. Its a Nice Article on dynamic Binding in wpf Technology.I got clear difference between static & dynamic binding Concept. U explained it in simple and smooth way. Be continue to sharing your ideas. can u please explain how to apply filter concept based on the value entered in the textbox to this example.